Today, i am going to have the discussion on the topic called as " BGP Route Aggregation". There are many instances in the network where you really want this BGP route aggregation should be there. May be you want to have the aggregated routes not the specified routes from the other networks. So now question is Why we required " BGP Route Aggregation" in the Network ? Well there are lot of reason for it, some says you have lot of routes specific from the same network and needs to avoid the same, so they want route aggregation in the network. Some says it is way to shorten the multiple routes in the routing tables. It also saves the CPU utilisation on the device itself. Where these kinds of Scenario used ? Like if we have the cases where service provider have so many routes on the PE router and you knew you have so many customers connected to your one PE route and you limit the routes ( may be 50 ) from the customer network and customer is asking for more than 50 routes may be there are lot of routes which are specific routes then you can limit them by using the long IP prefix routes or called as aggregated routes which can accommodate all the specific routes in a one route. Well all the points which is discussed above it right, For example, for the aggregate destination 126.100.0.0/16, routes to 126.100.192.0/19 and 126.100.67.0/24 are contributing routes, but routes to 126.0.0.0./8 and 126.0.0.0/16 are not. Route aggregation helps to minimizing the number of routing tables in an enterprise IP network which means, it consolidates selected multiple routes into a single route advertisement in which every routing table contains a unique entry for each route. On the router which does the aggregation, this technique does not help in reducing the size of the routing-table. Whereas when you configure an export policy which only advertises the aggregate but not the contributing routes anymore, you would have the aggregation effect on the routers which receive updates. A route can contribute only to a single aggregate route. However, an active aggregate route can recursively contribute to a less specific matching aggregate route. For example, an aggregate route to the destination 126.100.0.0/16 can contribute to an aggregate route to 126.96.0.0/13. Reject next hop—If a more-specific packet does not match a more-specific route, the packet is rejected and an ICMP unreachable message is sent to the packet’s originator. Metric value as configured with the aggregate statement. Preference value that results from the policy filter on the primary contributor, if a filter is specified. AS path as configured in the aggregate statement, if any. Otherwise, the path is computed by aggregating the paths of all contributing routes. Community as configured in the aggregate statement, if any is specified. 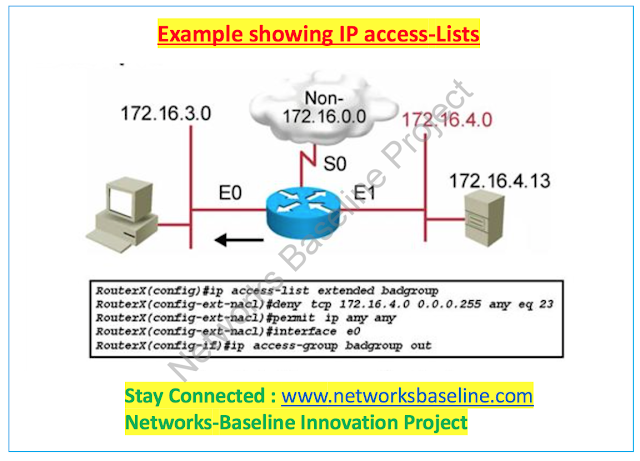 So let us suppose we have one AS 400. we have neighbor BGP addresses are 10.10.10.2 connected to AS 500, while neighbour 20.20.20.2 is connected to AS 600, Neighbour 30.30.30.2 connected to AS 700 and we got 3 routes named 180.10.0.0/16 and 180.20.0.0/16 received from AS 800. For the routes coming from AS 800 we need aggregated routes then we need populate the 180.0.0.0 255.0.0.0 in the BGP configuration as below. Let's check the configuration now. 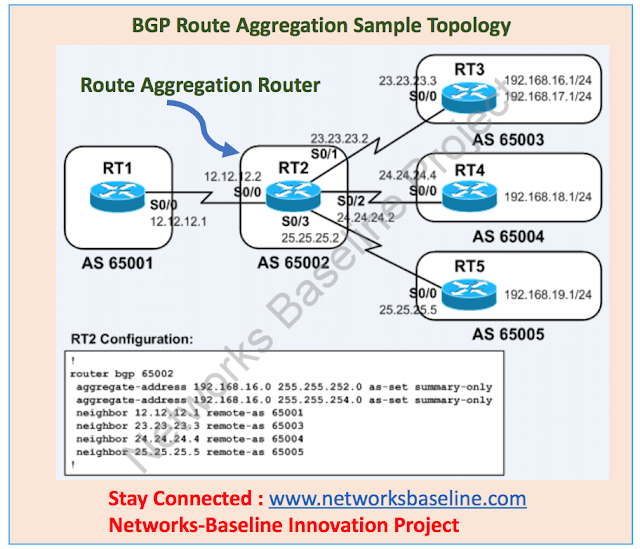 Hope the above example will clear your concept on " BGP Route Aggregation concept". Now you know which routes can be aggregated and how these routes can be done as route-aggregated routes.